Here is another Christmas in July card. I made this one for today’s Splitcoaststampers Color Challenge CC384 Very Vanilla, Cherry Cobbler and Gumball Green. 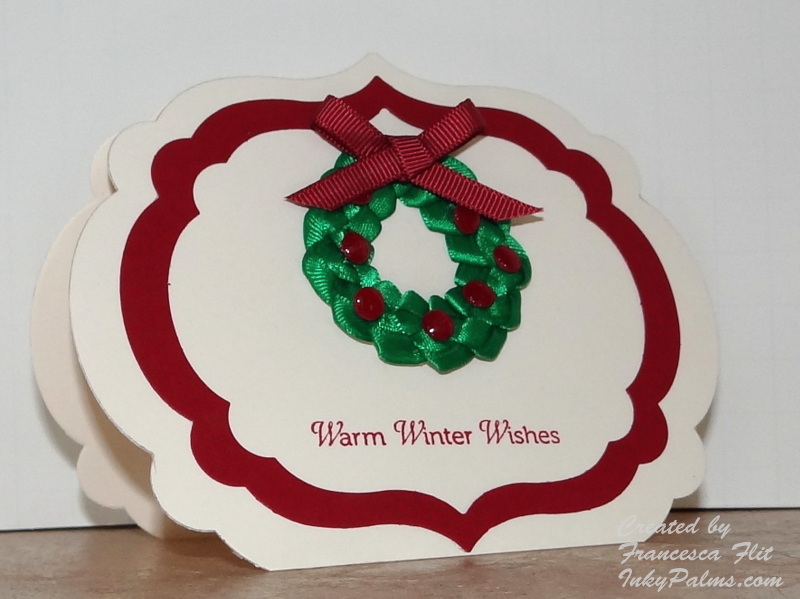 The dessert option was to make a Christmas card, so I decided to make a woven ribbon wreath card. When I was a little girl growing up in Miami, we used to weave palm fronds to make hats, bowls and wreaths. I don’t know what the technique is called, but you thread loops through loops to make a chain. I searched the internet and found this video from May Arts which is pretty easy to follow. For my wreath, I used 1/4 inch Satin Ribbon by Offray. One little useful tip, I used a 1 3/4 inch circle punch as a base for my wreath to help keep its shape instead of mounting it right on the card. For my card base, I used Very Vanilla cardstock and the Stampin’ Up! Labels Collection Framelits die. I folded the cardstock and placed the die so that the fold was just below the cutting edge and ran it through the Big Shot. I cut another one and adhered it to the front of the card and then trimmed the bottom edge. I decided to make a Cherry Cobbler frame instead of adding layers. I used painters tape to hold the dies in place and then ran it through the Big Shot. I glued the frame to the card base and added the wreath. I used a 1/8 in circle handheld punch to make the berries and added a little bit of Crystal Effects to give them a little dimension. I tied the bow with Stampin’ Up! 1/4 inch Bravo Burgandy Ribbon and attached it to the wreath with a glue dot. The sentiment is from Stampin’ Up! Winter Memories stamped in Cherry Cobbler. 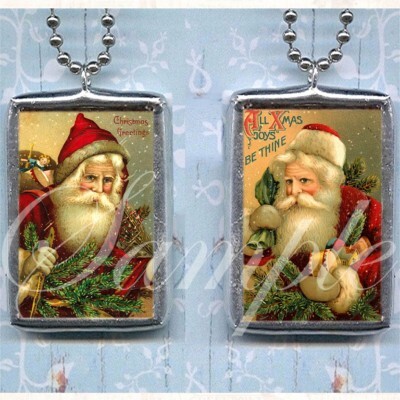 It’s July, time to start thinking about Christmas! I usually don’t like to make a bunch of the same card, so I try to make Christmas cards all through the year. 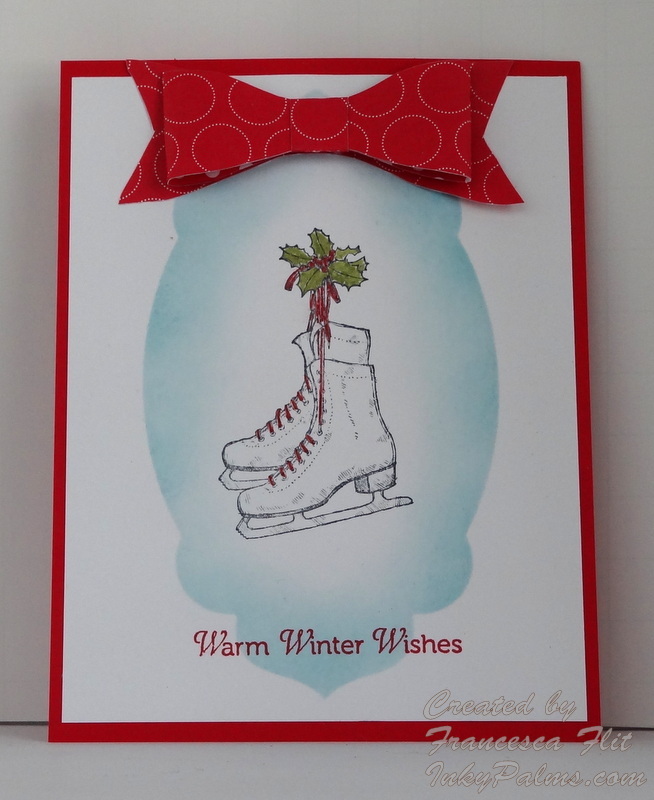 I also like to make Christmas cards with nontraditional colors to spice things up a bit! 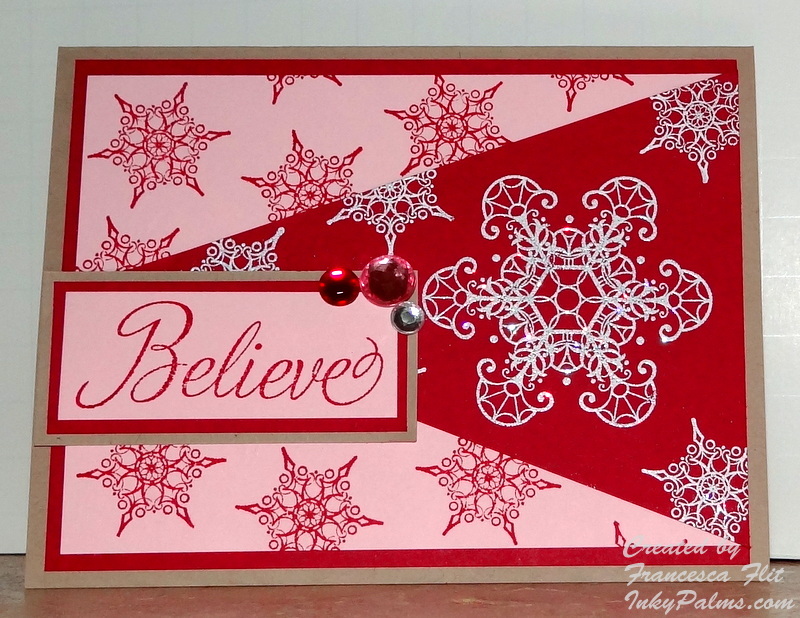 I made this card for today’s Splitcoaststampers Featured Stamper FS284 Cynthia aka StampinAK. 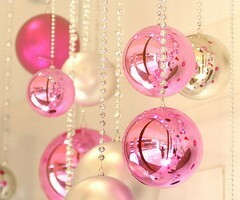 I chose her pretty Pink Winter card to case, I love her snowman image and the pink matting. For my card, I used Raspberry Ripple for my card base and mats. I stamped the PSX Santa Hat in Basic Black and added Dazzling Diamonds to the cuff and pom pom. I used Raspberry Ripple and a water brush to color the hat and a Raspberry Ripple marker to add the accents. 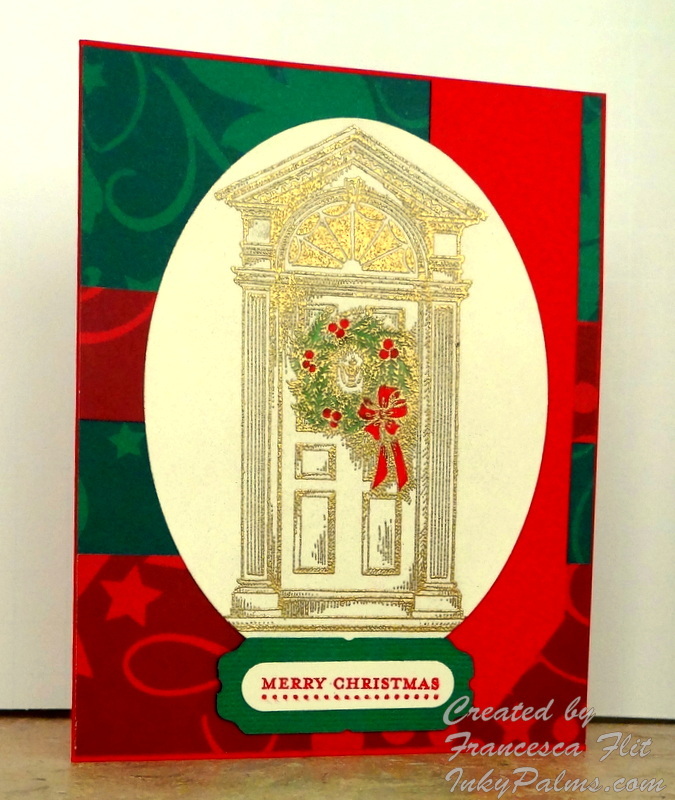 I sprayed the image panel with homemade glimmer mist made with Stampin’ Up! Frost White Paint and matted it with a Nestabilities die cut. I embossed the Whisper White background panel with an embossing folder, sprayed with the glimmer mist and mounted it on the Raspberry Ripple card base. I stamped the sentiment first in VersaMark, then in Raspberry Ripple, clear embossed and mounted on the card. This card went together quickly and I love the sparkle from the Dazzling diamonds and glimmer spray! This is the card I made for today’s Splitcoaststampers Inspiration Challenge IC344 ~ Indulgence by SV Soaps and yesterday’s Free for All Challenge F4A124 Wood You Like a Challenge?, to make a card with something related to wood. This was a fun card to make, but a little time consuming. I was inspired by the colors in this Island Nectar Soap and this Passionfruit Nectarine Soap. I used the Palm Frond stamp from Stampin’ Up! Tropical Party to create the wreath. I punched a small circle to use as a guide and layered the palm fronds stamped in Gumball Green. I the cut the center with a die a little bigger then the circle punch to clean up the edges and the outside with a die just larger than the wreath. I stamped shells from several Stampin’ Up! 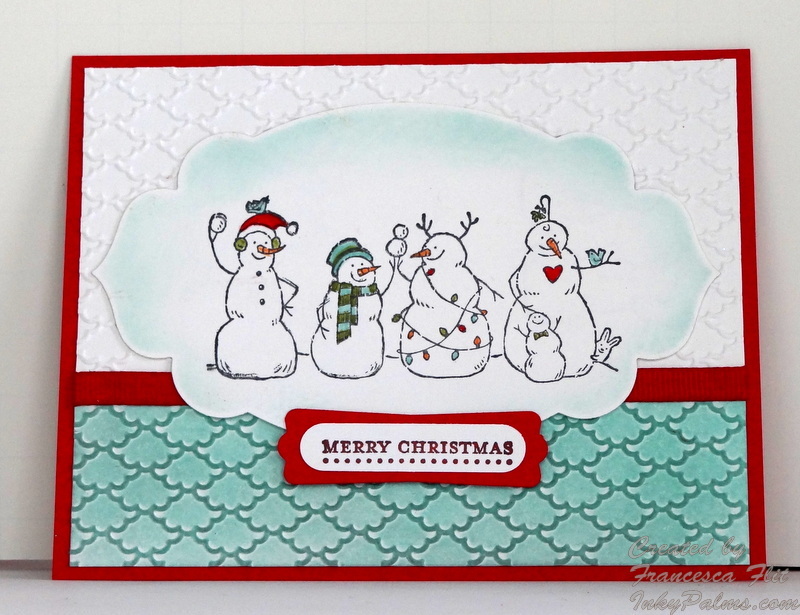 sets, Along the Shore, Stipple Shells and Calm Seas, and colored them with Stampin’ Up! Markers. I sprayed them with homemade glimmer spray I made using Stampin’ Up! Frost White paint. When that was dry, I added Crystal Effects and sprayed another coat of glimmer spray. While the shells were drying, I embossed a piece of Soft Suede with the Tim Holtz Woodgrain embossing folder, sponged it with Walnut Stain Distress Ink and mounted it on a Gumball Green card base. I attached the shells to the wreath with Crystal Effects and mounted on the background with Stampin’ Up! Dimensionals. 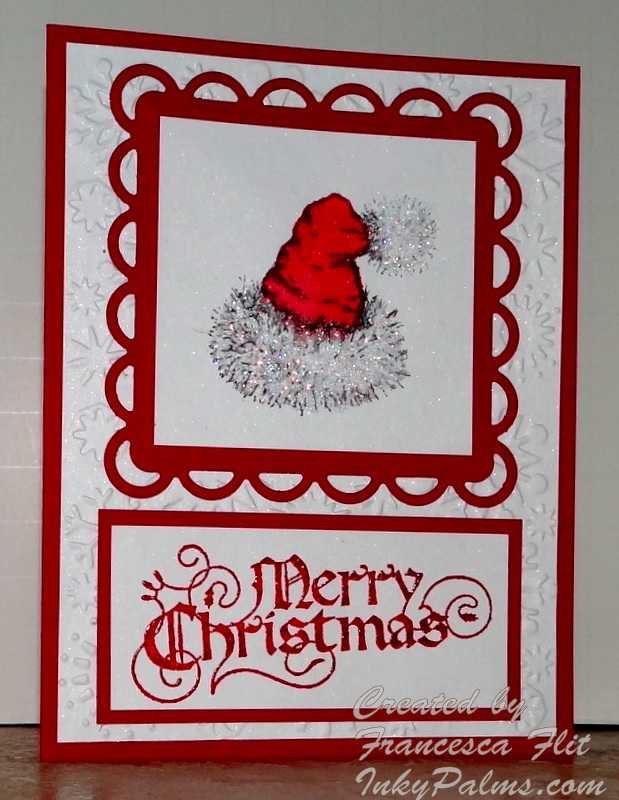 I stamped the sentiment from Stampin’ Up Christmas Greetings in Calypso Coral, cut with a Nestabilities Banner die, sponged the edges and mounted to the card wih a little pouf in the middle. This card was a little too time consuming for mass production, but I might make a few more before Christmas. 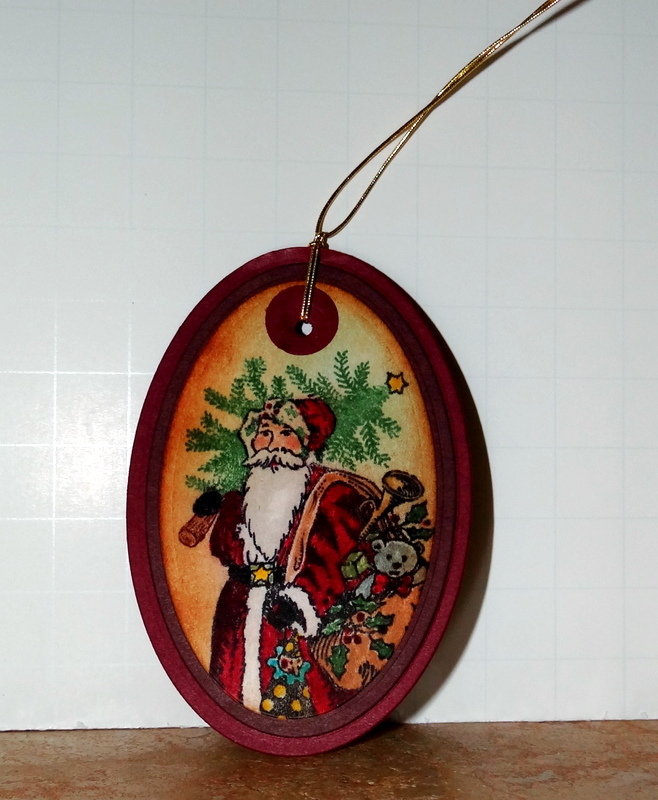 I love this PSX Victorian Santa and will probably use him for some of my Christmas cards this year. For my tag, I colored the image with Stampin’ Up! markers and sponged around the image with Apricot Appeal and Sage Shadow. I then sponged the whole image with Vintage Photo and the edges with Walnut Distress Inks. 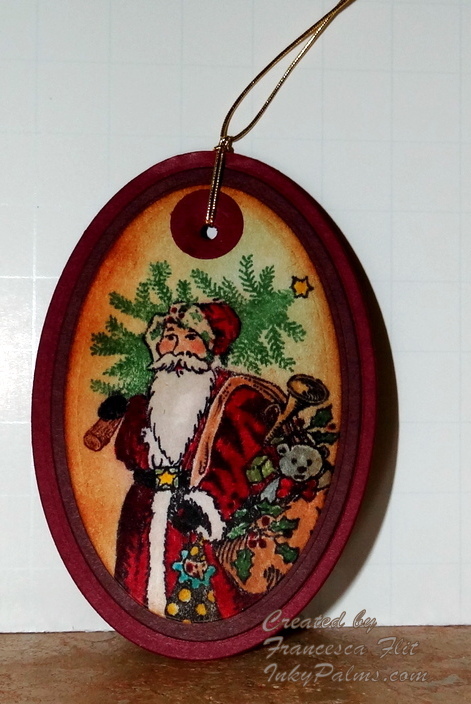 I cut the ovals with Nestabilities dies, using Chocolate Chip and Bravo Burgundy for the mats. 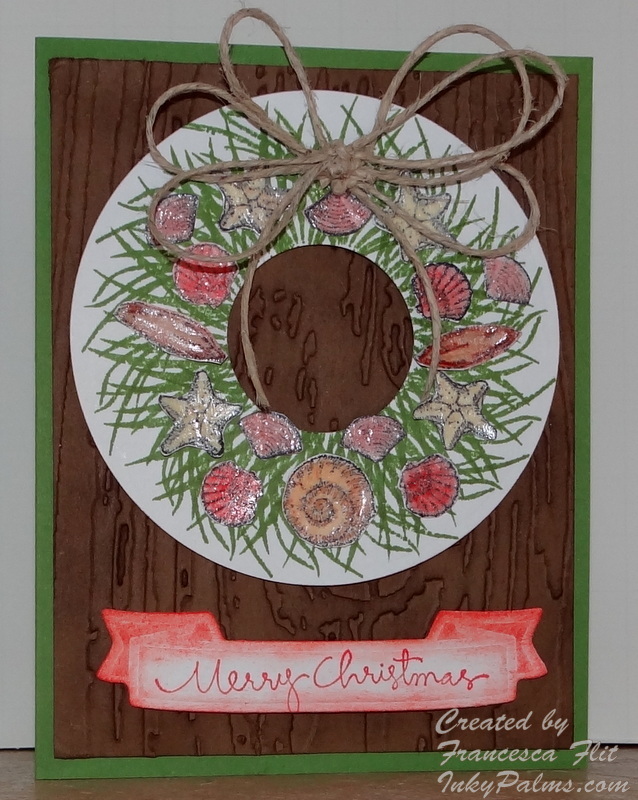 I punched two 1/2 circles with a Stampin’ Up! circle punch to reinforce the hole for the cording. I used a Stampin’ Up! 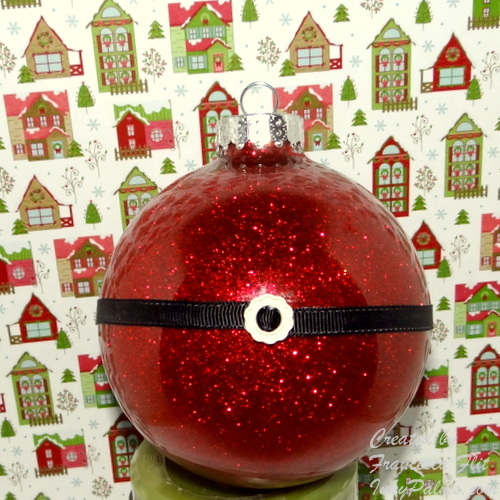 hand held punch for the hole and threaded it with Stampin’ Up! Gold Elastic Cord.